WASHINGTON: US Secretary of State Hillary Clinton said Tuesday that she will take part in next month’s meeting of Southeast Asian nations and regional powers in Cambodia. 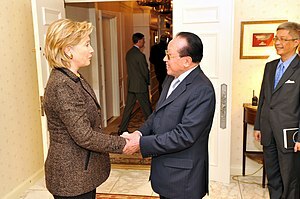 Clinton met in Washington with Cambodia’s foreign minister, Hor Namhong, as the developing nation prepares to host this year’s meetings of the Association of Southeast Asian Nations (ASEAN). “We are looking forward to coming for the ASEAN Regional Forum to Cambodia in July,” Clinton told reporters. Hor Namhong said that he was also inviting President Barack Obama to take part in the next ASEAN summit, which will take place in Phnom Penh in November soon after the US presidential election. The Obama administration has put a top priority on building relations with ASEAN, believing that the United States can benefit from ties to the economically dynamic and largely US-friendly bloc. The ASEAN Regional Forum includes powers outside Southeast Asia including the United States and China. Clinton has said she will also visit Japan on July 8 for a conference on the future of Afghanistan. South Korean media has also reported that she will stop in the country to talk about North Korea and visit the US pavilion at the World Expo in the southeastern city of Yeosu on July 4, US Independence Day. Posted by The Aseanists Time, Unmask The Truth on June 13, 2012 in The Aseanists Time and tagged ASEAN, Barack Obama, Cambodia, Hor Namhong, Phnom Penh, Southeast Asia, United States, WASHINGTON.